Richmond Builders Supply | St. Henry Tile Co.
We are dedicated to exceeding our customer’s expectations in quality, delivery, and cost through continuous improvement and customer interaction. Thanks for visiting our website. Please give us a call at 765-966-7771. 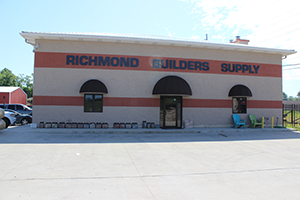 Richmond Builders Supply (formerly Barkers, Inc., The Fireplace Shop) was purchased by St. Henry Tile Co., Inc in July of 2011. We look forward to continuing to serve the Richmond Area and are constantly expanding our product line to better serve your needs. Directions (from I-70 West): From the intersection of US Route 27 and I-70, go south to N H St., turn east then immediately south onto Chester Blvd. and you will find us at the corner of Chester Blvd. and N F St.